In a large bowl, mix all the cookie ingredients using a wooden spoon till thoroughly combined. (Dough will be wet!) Oil your hands with vegetable oil to prevent mixture from sticking to your hands. Form the cookie dough into 1 tablespoon balls. Place them at least 1 inch apart from each other on your non-stick baking tray. Bake for ~10 minutes or until cookies turn slightly golden brown. Cool completely, at least 20 mins. In a medium glass bowl, whisk all the filling ingredients until smooth. Cover and refrigerate until you’re ready to assemble the whoopie pies. Using an angled icing spatula, spread desired amount of filling on the flat side of 1 cookie. Top with another cookie and gently press them together to form a whoopie pie. 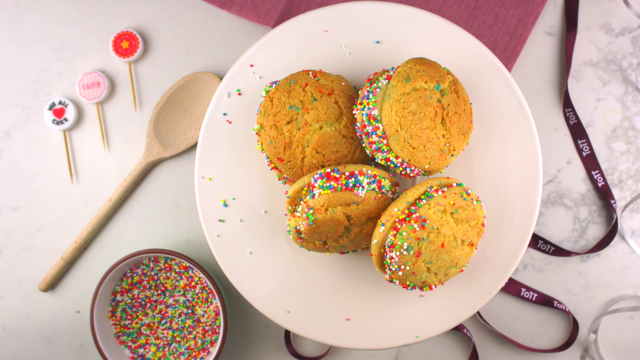 Roll the sides of your whoopie pies in rainbow sprinkles. Repeat until all cookies are used.